You don’t have to save fried pickles for trips to the bar anymore. 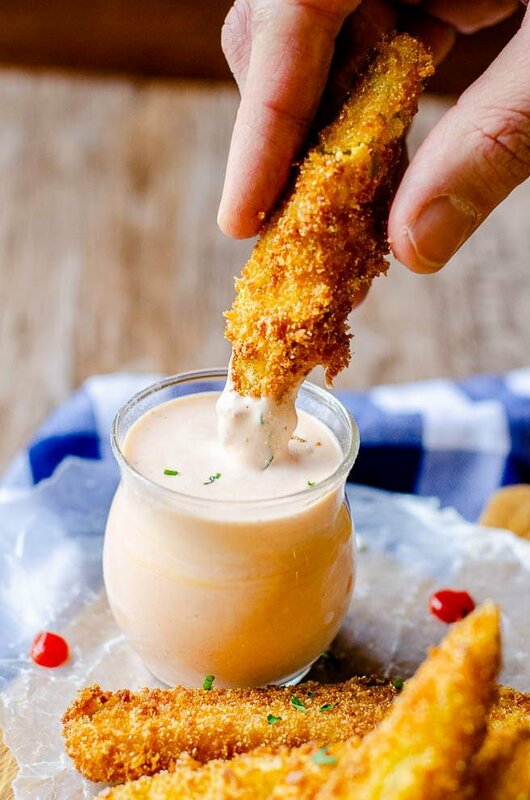 Make your own homemade deep fried pickles and dip them in this creamy sriracha ranch for perfect football food at home. I love fried pickles, but I don’t like the fried pickle slices that most bars and restaurants serve. There ends up being too much breading and not enough pickle. When I eat deep fried pickles, I want to taste the saltiness of the pickles. These deep fried pickles subscribe to the more pickles, less breading style. It uses dill pickle spears (instead of slices) that are coated in a special seasoning and panko before being deep fried. 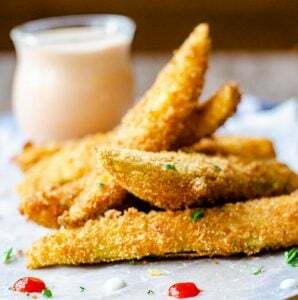 Served with sriracha ranch dipping sauce that has a slow burn, you’ll never want to eat restaurant fried dill pickles again. If you don’t have a deep fryer, don’t stress, you don’t need one. The important thing is that you use enough oil to completely submerge the pickle spears. As long as there is enough room for the pickles to float, you can use a pot or a skillet. Keep in mind, the wider you pot, the more oil you have to use. Conversely, the narrower your pot, the more batches you will have to make. Take your fried dill pickles up a notch by improving your culinary proficiencies. How To Deep Fry. If you’re wondering if deep fried pickles are fattening, then this is the post for you to check out. It explains how temperature control impacts oil absorption and keeps these fried dill pickles from being too greasy or fattening. The Best Oil For Deep Frying. Choose the best oil for your deep frying from this list of safe options. Which Cornmeal To Buy. Since the pickles are coated in a flour and cornmeal combination, you may need help picking the right cornmeal. This explains all about the different varieties, and which one will best suit you. Dry Spices 101. If you haven’t checked your dried spices for quality or freshness recently, this explains what to do. Personally, I love a little heat to accompany my fried dill pickles, but just hot sauce doesn’t quite cut it. That’s why I recommend pairing these deep fried pickles with a sriracha ranch dipping sauce. It has a creamy flavor up front that tamps down some of the saltiness of the pickles, and a slow burn at the end. If you’re a lover of tailgating and game day foods, then no wonder you ended up here. This recipe is part of a collaboration with other food bloggers focusing on game day football food. 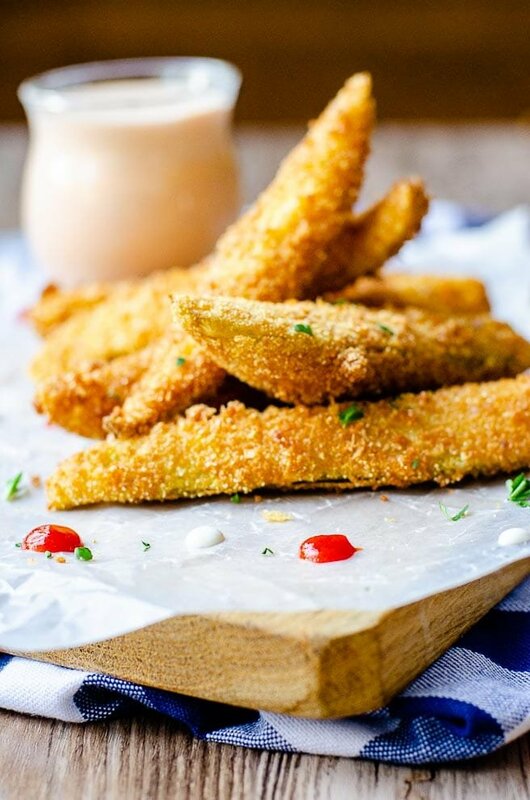 Complement these deep fried pickles with one of these other great football food recipes! These deep fried pickles are so crispy and pair perfectly with a good craft beer. Make sure to pat your pickles as dry as you can. If they are too wet when you fry them, the breading slides off when you go to dip them. 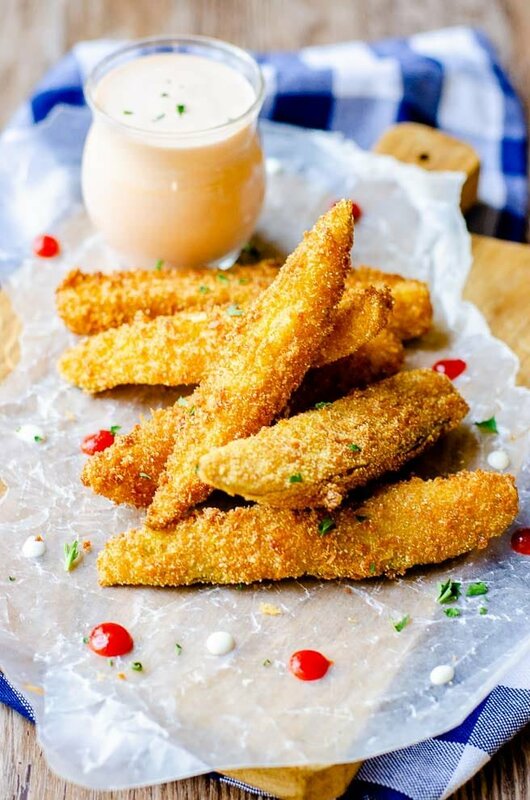 Want a free printable grocery list for this deep fried pickles recipe? Get it HERE. Enjoy the restaurant quality taste and texture of the deep fried pickles at home. They have a crispy, golden brown outside and are served with a dipping sauce that starts creamy and has a slow burn. Drain your pickles and pat them as dry as you can. Set them aside. Stir together the ranch dressing and sriracha and set aside. Create your breading station. Mix together the flour, garlic, and cayenne in one flat bottomed container and set aside. Whisk together the eggs and water in a second flat bottom container and set aside. Stir together the cornmeal, bread crumbs, and panko in a third flat bottomed container. Depending on the size of your pot*, pour 4-6 cups of a safe frying oil into the pot and bring to 375 degrees. Reduce the temperature just a bit when you achieve the temperature so it maintains and doesn't get too hot. Take the dried pickles through the breading station. First toss them in the flour until evenly coated and shake off any excess (too much flour will cause the breading to slide off). Dip into the egg wash until evenly coated and let any excess drip off. Finally, transfer to the bread crumb mix. Push each side down into the bread crumbs making sure each side is evenly coated. Shake off any excess. One at a time carefully place the breaded pickles into the frying oil. You can fry 4-6 pickles at a time. Cook each pickle for about 4 minutes, or until golden brown. Using a slotted spoon, transfer the deep fried pickles from the oil to a paper towel lined plate. Let them cool for a minute, then serve with the sriracha ranch dipping sauce. *I used a six cups of oil in a four quart pot. *There are roughly 12 dill pickle spears per 24oz. jar. This recipe factors calories and servings based on that estimate. My husband would LOVE these! They sound delish! It such a great recipe! Perfect for game day or just when you’re craving bar food at home! Fried pickles are pretty much my love language! Want! We share a love language then, Kate. 🙂 Fried pickles are the BEST! I can’t believe I’ve never had fried pickles before. I can’t wait to try your recipe. Man oh man! I love these pickles but I haven’t made them for myself! I cannot wait to see if I can make them as good as you. You’re too kind, Terri. I hope you love them! I have never had deep fried pickles. A new adventure for me to take. Once you have them, you’ll want to make them all the time. A perfect game day food that you can have at home! I’m not a huge pickle fan either, but I could eat fried pickles all day long! Those pickles look so golden brown and delicious, and I want to put that sauce on everything! I make extra of the dipping sauce and keep it around because it is so delicious on so many things! Pickles are my favorite! I love this recipe and can’t wait to give it a try! You are so talking my language with these guys! Love at first sight! I never tried deep fried pickles. I need to change that! They are so good, Cindy! I’m sure you’ll love them! I totally am the same way! The only time I crave pickles is when I’m pregnant, but I could eat fried pickles weekly! They’re always a big hit. Even my 10 year old requests more of them! I LOVE FRIED PICKLES! I can’t wait to try this recipe at home! Yes!!! Fried pickles are one of my favorite appetizers! I love deep fried pickles but have never made them with pickle spears. I’ve only used the rounds. The pickle spears are my favorite because you get more pickle flavor, but the rounds are great as well because you can just pop them in your mouth.